Australia’s smartphone users are a loyal bunch, but there are still opportunities for brands to stand out and make their mark. Here, we explore new research that uncovers the path to purchase for mobile phones to help marketers understand key moments where they can have an influence. Of all the devices we use every day, smartphones are by far the most personal. That’s why when Aussies find a brand they like, they typically stick to it. While this level of brand loyalty creates a daunting challenge for mobile phone marketers, the nature of today’s path to purchase still leaves them with a number of valuable—and sometimes overlooked—moments to be considered. 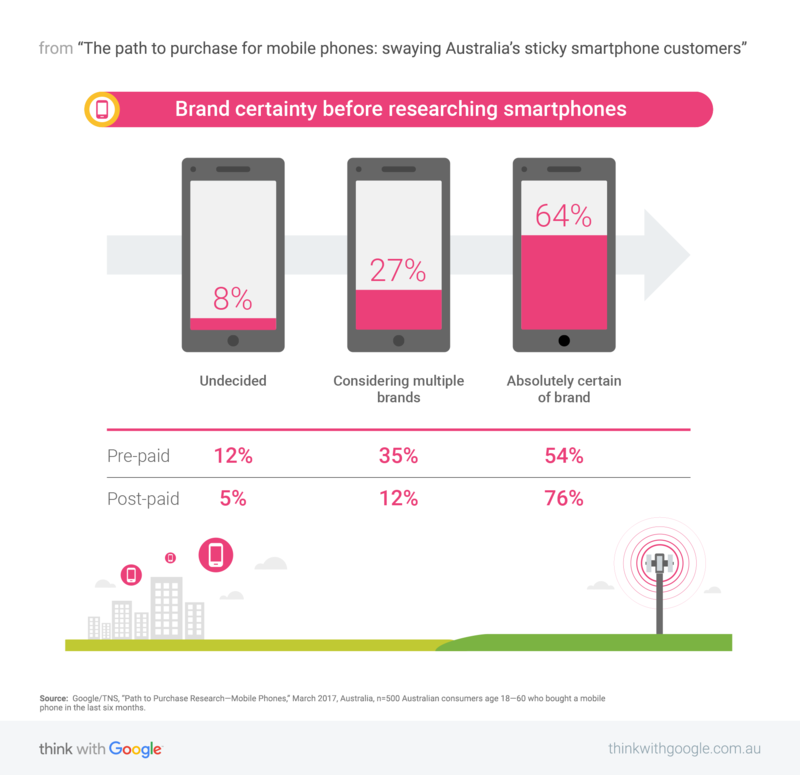 To better understand the research behaviour of Aussies in the market for mobile phones, we partnered with TNS Australia for a quantitative and qualitative study that explores their typical path to purchase.1 As part of the study, we spoke with 500 mobile phone customers about how they research and choose original equipment manufacturers (OEMs) and phone carriers. Here, we’ll break down four takeaways for marketers to consider in their strategies to acquire new customers and retain existing ones. Because mobile phone purchases are typically routine, repeat, or replacement occasions, Aussies tend to stick with the brand they know or one that’s served them well. More than half (64%) of consumers said they’d already decided on a brand before entering the market, and 60% had a strong preference for brands they’d bought before. 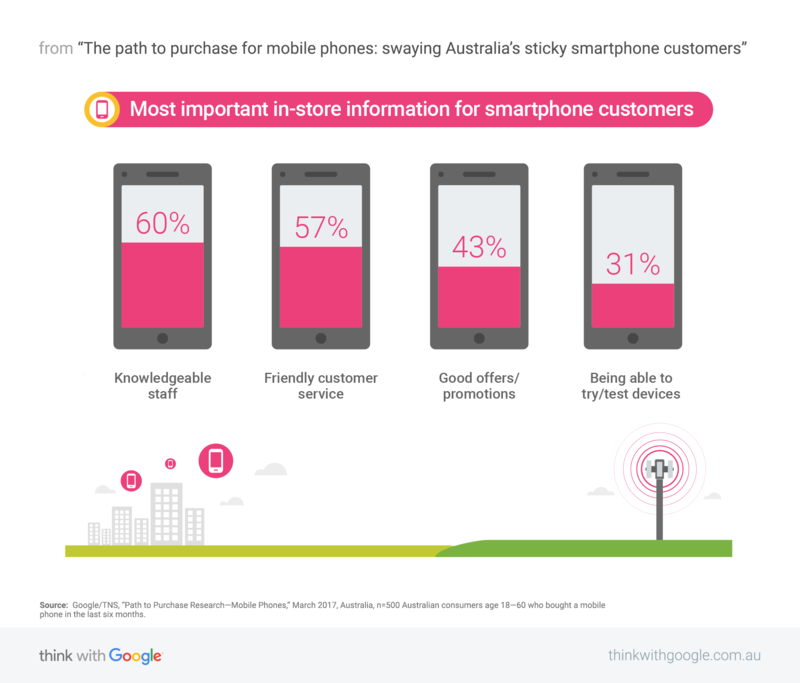 Source: Google/TNS, “Path to Purchase Research—Mobile Phones,” March 2017, Australia, n=500 Australian consumers aged 18-60 who bought a mobile phone in the last six months. In fact, brand certainty is the highest for mobile phones compared with all other verticals in our research. Sixty-four percent of users said they knew which brand they wanted when they began planning their purchases—nearly 2X the average of the other verticals—and 60% ultimately bought the brand they initially intended to purchase. Loyalty to telco providers is just as prevalent, with 81% of consumers continuing with their current provider when it comes to signing a new contract. Because so many smartphone purchases are made by repeat customers, OEM marketers should double down on reaching undecided and first-time buyers. Carriers should customise their messaging to call out promotions and phone features to ensure they’re appealing to current customers. Focusing on being useful and relevant to Aussies who haven’t yet decided on their brand of choice is sure to spark opportunities to secure new customers, possibly for a lifetime. While they’re especially brand loyal when it comes to the device itself, smartphone users do consider new carriers at key moments. When looking to buy a new phone, for example, many will consider switching, especially if they can get a better deal elsewhere. In total, 17% of consumers changed carriers when buying a new device. 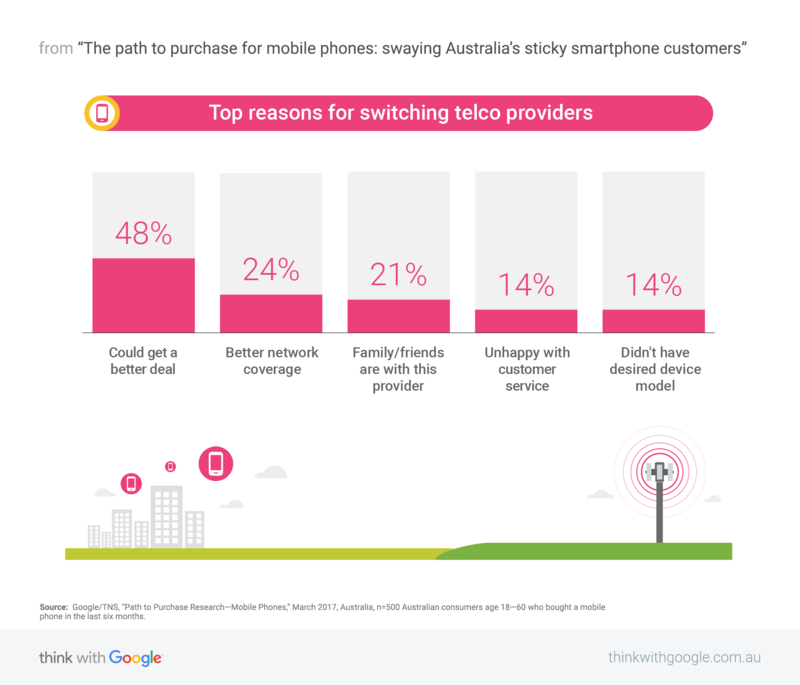 Source: Google/TNS, “Path to Purchase Research—Mobile Phones,” March 2017, Australia, n=500 Australian consumers age 18-60 who bought a mobile phone in the last six months. Because many mobile users upgrade when a new device is released, phone launches are a key time for carriers to acquire new customers. Budget is Aussies’ main priority when choosing a new contract, but it’s important to note that 20% of post-paid plan purchasers said the most important factor was whether or not a carrier offers the latest available device. To get in front of consumers considering a switch, carriers should align the timing and messaging of their digital campaigns with new device launches. These events are key to both acquiring new customers and defending existing ones, so it’s also important that OEMs develop unique audience strategies for each group and share relevant details about upcoming launches for users’ current phone brands. It’s no surprise that the internet is consumers’ most valuable tool for researching and comparing mobile devices. A total of 81% of Aussies in our surveys conducted their research online, with search being their most-used touchpoint, followed by retailer and brand websites. Even if they’re certain about their brand of choice, consumers like the convenience of being able to search for better deals, learn about device features, or possibly discover a new brand before visiting a store. In these early research moments, Aussies are looking for detailed phone features, price comparisons, and promotions to reassure their decisions—or possibly convince them to switch. While mobile users are largely brand loyal, this is the time when new options surface on their radar. Nearly one in four consumers discovered a new brand while researching, and 53% discovered it while researching their current device. Smartphone users depend heavily on digital to research their options, so it’s crucial for marketers to prioritise their online presence. Because search is the go-to touchpoint, marketers should optimise their search ad messaging to ensure consumers can easily find the device specifications and price details they’re looking for. Retailers and OEMs should also ensure their websites are chock-full of easy-to-find product details and information. Smartphones may be the quintessential device of the digital age, but the path to purchase is far from being an entirely online experience. In fact, the vast majority of consumers in our research (68%) purchased their devices offline. Even among those who researched and compared devices online, 53% ultimately visited a retail store to make a purchase, with just over half saying they wanted to physically see and touch the devices before buying. The allure of in-store visits is driven primarily by the chance to receive personal help and reassurance from an expert—54% said they went to a store to interact with staff, and 60% of all consumers in our survey said that knowledgeable staff was most important when visiting a store. Consumers won’t simply settle for the brand with the lowest price—customer service is paramount, both on- and offline. Consumers should be able to find answers to their questions with a quick search and then easily find a retail store to get more assistance or make a purchase. And while price remains the primary reason consumers switch carriers, many in our survey said they’d make a switch if they felt they weren’t getting enough support. It’s also crucial to recognise the connection between consumers’ online research and offline interactions. Measuring the number of in-store visits driven by search ads can help brands gain a single view of the customer journey and understand how their online efforts are impacting offline sales. Because marketers have relatively fewer moments to influence smartphone buyers, it’s crucial to understand when they can be most helpful in order to acquire new customers and double down on existing ones. This includes both online—where the most important decision-making takes place—and offline—where customer service is king. Capturing and keeping Aussies’ loyalty takes a true understanding of the information they need in order to offer a helpful and seamless experience before, during, and after the sale. 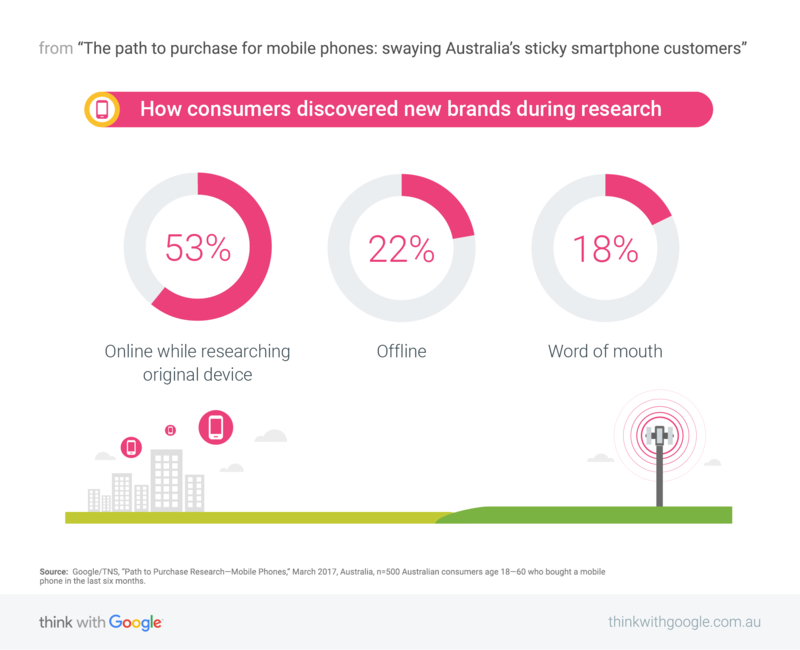 Google partnered with TNS Australia to conduct quantitative and qualitative research to explore the mobile phone path to purchase (where consumers look for information, where they purchase, their brand loyalty, etc.). We spoke to 500 Australian consumers aged 18-60 years old who bought a mobile phone in the last six months prior to the survey. 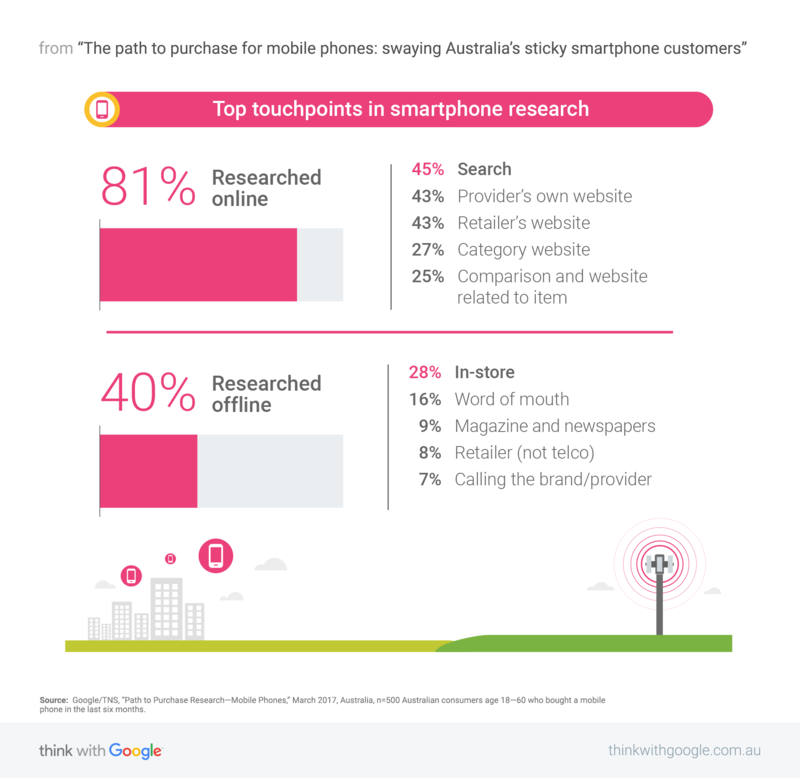 1 Google/TNS, “Path to Purchase Research—Mobile Phones,” March 2017, Australia, n=500 Australian consumers aged 18-60 who bought a mobile phone in the last six months.